Normally the weather holds out until the first weeks of September, but this year it seems that the first overcast days have arrived in late August. With the change of weather we decided to go back into the countryside for walking, this time from Verges towards the hills of Castellar at the back. This is an area not so far from L'Escala. We last visited Verges for the Dance of the Dead (Verges - Dansa de la Mort) which takes place in Easter week, but it was more to see the procession than to see the town. This time we're in daylight so can explore a little further afield. 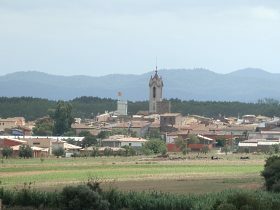 Verges itself is a small village that acts as a junction point for cars coming from the north going either to Torroella de Montgri, or continuing south to La Bisbal and then to Palafrugell or Palamos - so it has a sense of being something of a transit town. We park just up by the football field and then walk back down to the village. In an open space just next to the junction for the two routes, a small flea market has set up and we walk around the stalls bewildered to see rusty saws and old glass drinks bottles for sale in amongst the older furniture and book collections. 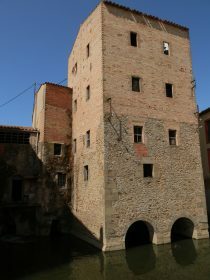 We walk down the road in the direction of La Bisbal to see an old water mill that we often see on the way up to Figueres. Verges sits just above the river Ter, which is a broad river which always has water and is navigable by kayak or canoe (hire point at Colomers, two villages along the river from Verges) and Verges itself has a small stream that runs around the village before passing underneath the disused mill. Following the road around the back we can see the stream which almost looks like a moat protecting the central houses with small bridges across the water to reach the gardens. We turn up across the stream and enter the main village part and head towards the church. 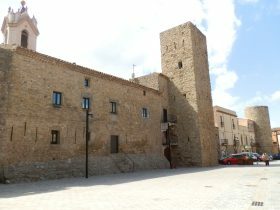 The church tower always looks impressive and well cared for from a distance, In the main square is an old castle-like structure - a big stone building with a tower but despite Verges fame, the rest of the houses and streets in the town are rather plain and drab and without the darkness or candle light, the village lacks much in the way of charm. Leaving the centre we head back towards the football field where we take the right hand fork (marked as a health route) to the fields and on towards a farm. Some times walking through fields feels delightful with crops growing, fertility and butterflies and insectts. In this case, he ground is flat but rough and feels unkempt. It's not helped by the small drainage ditch to the left of us which had been filled by the recent rain, and is now smelling as it dries out again. We walk past a number of cheaply-made red-brick farm buildings which seem to be the norm for this area. 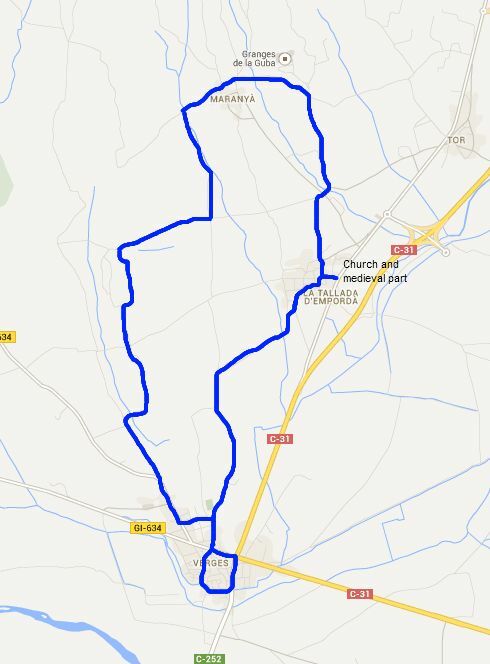 We continue across the landscape in a sullen plod and turn towards Tallada d'Emporda. In the background we can see the Castle of Montgri and in the distance the hill at Montgo near L'Escala but the it feels uninspiring. 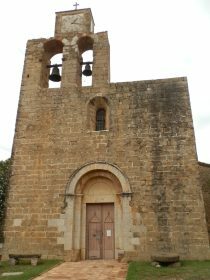 As we reach Tallada d'Emporda there are series of newer buildings as we enter the village and we can see the clock on the church, just above the bells. We navigate the backstreets and find the church besides the castle in a medieval area strangely away from the village centre. An old farm sits in what would have been the castle forecourt with a barn in the same roughly laid red bricks style which looks so tatty. The area is being refurbished so this might not be totally fair, but at the moment the area feels uncared for. We have the option of continuing to Tor or going up directly to Maranya. As you might be able to tell, we're not finding the walk so attractive so we decide to go directly to Maranya and up towards the hills of Maranya. We're definitely in pig farm country and numerous low red brick buildings dot the fields or sit along side the path. 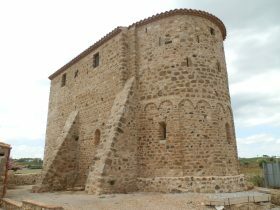 Maranya is a hamlet on the fringes of the hills and has good views to the distance and down towards Verges. Behind the hamlet into the hills, the vegetation changes more to trees and low scrub with broad tracks. We take a break at the very well restored chapel at the top of the village, then rather than continue into the scrub, we take the path down and start heading back. It's peaceful and rabbits sit on the track in front of us, before darting into great sandy burrows to the right of the path. We turn left and head through a small wood full of pine scent before zig-zagging our way back down to Verges slightly disappointed by the walk and the area.